Poland said the development was of the "highest concern", adding it was monitoring the situation. Russia's defence ministry said the new deployment was part of military exercises and had happened before. The US and Nato have seen disagreements with Russia intensify in recent times, particularly over Syria and Ukraine. Kaliningrad is a Russian enclave sandwiched between Poland and Lithuania. 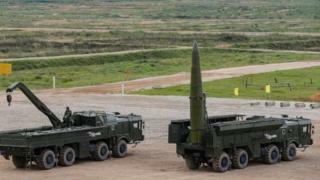 The Iskander system has a range of up to 700km (440 miles) and could reach the German capital, Berlin. Polish Defence Minister Antoni Macierewicz called Russia's activities "very alarming". And a US intelligence official told Reuters the move could be to express displeasure at Nato. Nato is boosting its eastern flank by deploying four battalions in Poland, Lithuania, Latvia and Estonia next year. But Russian defence ministry spokesman Igor Konashenkov said the deployment was "not exceptional". Russia's annexation of Crimea and its support for rebels fighting in eastern Ukraine provoked considerable alarm in this region that Moscow might also consider aggressive action against countries on Nato's eastern flank, says the BBC's Adam Eston in Warsaw. Nato sought to soothe those fears at its Warsaw summit in July by announcing it would deploy troops to both the Baltic states and Poland, our correspondent says. Nato said it was a purely defensive action but Moscow sees it as a threat and the deployment of the missiles could be viewed as a counter measure, he adds. Iskanders were sent to Kaliningrad during military drills last year. Russia's annexation of Crimea and its support of Syrian President Bashar al-Assad continue to test relations with Western powers. Finland, Sweden, Estonia and Latvia are among nations reporting recent air-space violations by Russia's military.